This coat is saving my life this winter so far! Our weather has been so wacky, its been going from 12 degrees to weather in the 50's day to day. Its my first time owning a faux fur coat and I'm obsessed, this bad boy has been keeping me so warm compared to other coats I own. Best investment this winter! I added a cozy fisherman knit sweater, denim and my comfy leather suede booties for a night out at our favorite local sushi place! gorgeous photos! I love that bag!! Lovely photos ♥ Love your style! I really love this outfit! The coat looks beautiful, and so does the sweater! Woow I like your fur coat so much , it's awesome and you are so sweet! My new post is up , so if you could check it out it would be great! I love this coat and how you wear this whole outfit! You look fabulous! You look so beautiful and glamorous! Love the coat! love your bag! and that coat is amazing! 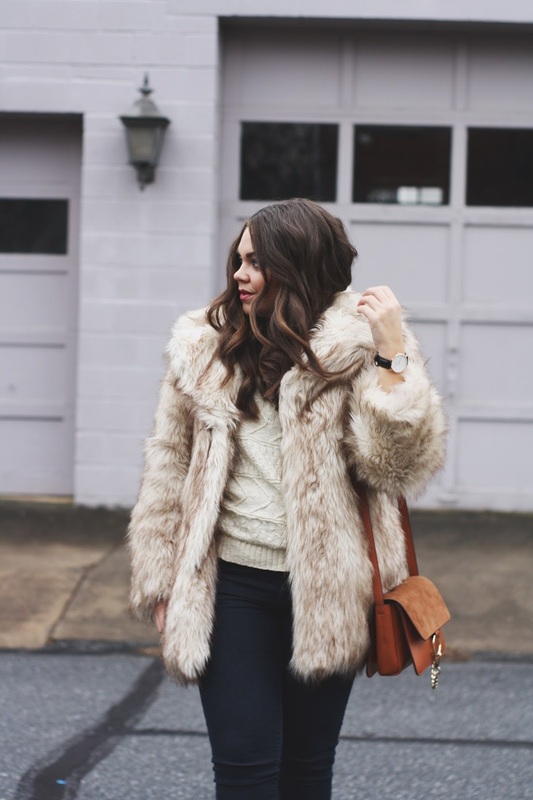 Absolutely love that fur coat! So chic! This look is to die for, I love everything about it. The coat is amazing, have almost the same one :) Bonjour from France, Sand. So cozy! Love your outfit! You look so gorgeous in this coat!